The inaugural international MugsarFest - it is being planned for the Solstice 22 December 12017CT. A small venue in the fledgling year might possibly be at the new Rockdale (next to Sydney Airport) Library complex. Down the track we are thinking of utilizing the large area where Tara plays netball - the St George Netball Association courts on West Botany. They really need an indoor facility anyway - so many games get washed out as Sydney's rainy season (June) is right in the middle of the main comp. So the international MugsarFest would be an excellent way to attract sponsors and funding. 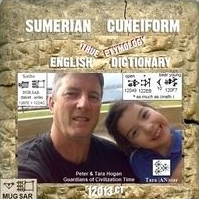 It will have a varied program, including sales/auctions of signs on the Mugsar and actual works created by students for the MugsarFest and workshops – like how to write on clay; prizes for best clay tablet works, and may be even replicas of famous Sumerian clay tablets, like the Gilgamesh Epic. 2. Setup a MugsarFest Fundraising Franchise in a local economy (no permission or fee required). 3. Hold your successful local MugsarFest. 4. Upload to Youtube a montage of you doing the planning, preparation, moving around on the big day - including a shot talking to the dignitary who also presents the grand jury prize - provided by your major sponsor - for best student Sumerian clay tablet work, which is duly auctioned off at the event finale. End credits feature the presentation of the funds raised to the NFP. Everybody wins! 5. Add Youtube link to your Harvard application.